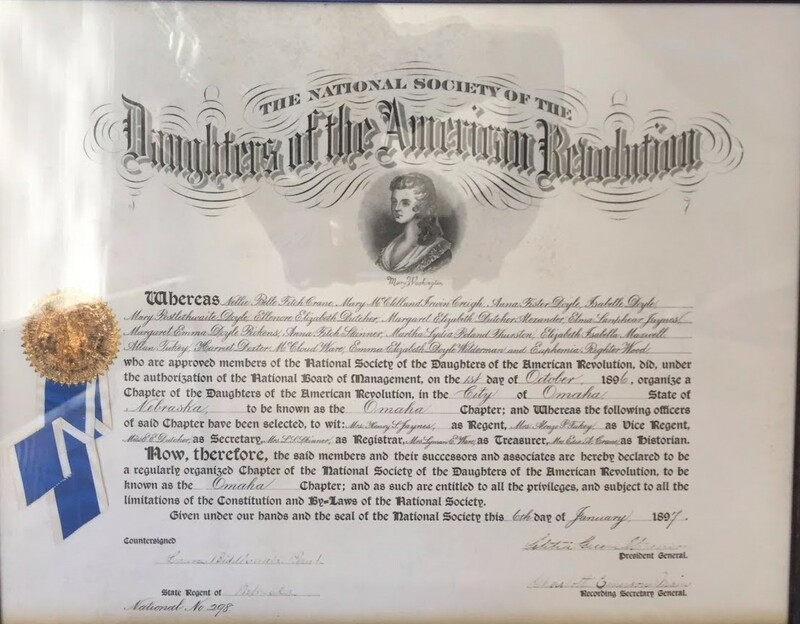 For 120 years, the Omaha Chapter of the National Society Daughters of the American Revolution has been committed to the threefold purpose of Patriotism, Historical Preservation, and Service to our Community. When you join the DAR, you become a part of a network of more than 180,000 women who form lifelong bonds, honor their revolutionary ancestors and promote historic preservation, education and patriotism in their communities. More than 200 years ago, American Patriots, pledged “their lives, their fortunes and their sacred honor” to fight for the freedoms we enjoy today. If you have a Revolutionary Patriot in your family tree, becoming a member of the DAR honors and preserves the legacy of your ancestor. Any woman 18 years of older who can prove lineal, bloodline descent from an ancestor who aided in achieving American Independence is eligible to join the DAR. If you think you may be eligible for membership, please email our Chapter Registrar! We would be delighted for you to attend one of our meetings and will be happy to help you with your application. The Omaha Chapter NSDAR has in the past year.. Participated in the National Day of Service celebrating the 125th Anniversary of the Founding of the National Society Daughters of the American Revolution. Promoted Patriotism through Good Citizenship awards, sponsorship of a local Chapter of the Children of the American Revolution, and support of the local VA hospital. By participating in the Omaha Chapter NSDAR’s many programs and chapter activities, you will remember and honor your ancestor’s legacy while building life-long connections with amazing women from all facets of life. As the Omaha Chapter Regent, I would like to welcome you and invite you to visit one of our meetings! The Omaha Chapter of the Daughters of the American Revolution shares its name not only with the city of Omaha but also with Omaha Indian tribe for whom the city was named. Omaha has a rich history dating back to the Louisiana Purchase in 1803. At that time, the territory that would eventually become Nebraska Territory, and later Omaha, was essentially occupied by Native Americans. The early Omaha Indians, arriving from the lower Ohio valley, were a part of the five tribes of the so-called Dhegiba groups of the Siouan family, the other four being Kausa, Quapau, Osage, and Ponca. By the early 1800s, Lewis and Clark found that the Omahans had moved into the vicinity of the present-day Omaha and established their presence. Their name, Omaha (actually U-Mo’n-Ho’n), means “Dwellers on the Bluff” and has been frequently translated as “against the current” or “those going against the wind.” It has been speculated that the Omaha Indians took this name because of the difficulty they incurred moving northward against the current of the Missouri River. Among the early legends of the Omaha Tribe is one that tells of a great battle waged during the early history of the state. Every warrior of an enemy tribe was killed, except one – who was cast, wounded, into the swift current of the river. He escaped by swimming against the current to a point far above where he had been thrown in. As he left the water on the opposite side, he lifted his right arm and defiantly exclaimed, “E-roma-ha.” His defiance was interpreted as meaning fortitude and courage. Whether taken from “U-Mo’n-H’n” or “E-roma-ha”, Omaha was officially incorporated as a city by the state legislature in 1857. Collecting boxtops to support DAR schools. 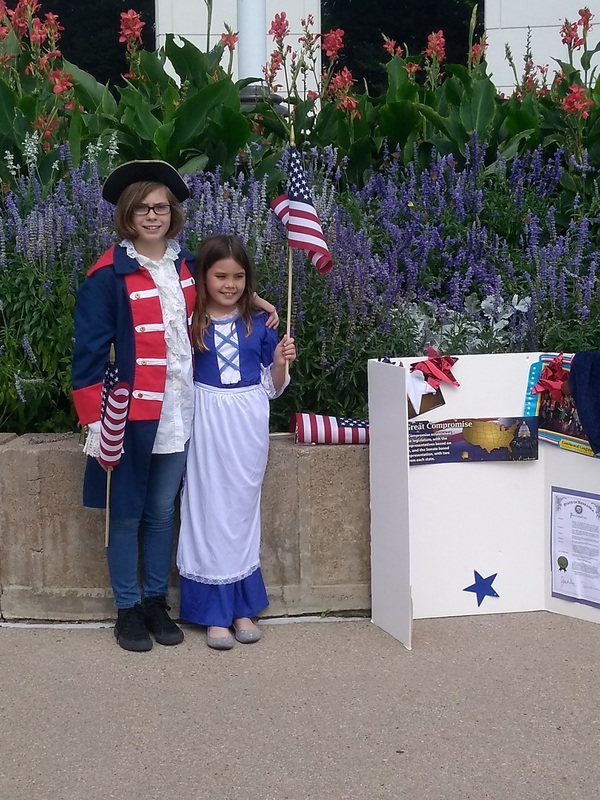 Omaha Daughters are reminded of the founding principles of the United States of America and the great privilege of citizenship at each meeting as they recite the Pledge of Allegiance, Preamble to the Constitution, and raise their voices to the national anthem. Monthly meetings also include brief, informational reports on areas of national interest. Just as the 56 signers of the Declaration of Independence pledged their “lives, fortunes and sacred honor” for the cause of liberty, today’s armed forces have dedicated themselves to protecting the freedom that was purchased at great cost by our ancestors. In appreciation for their service, the Omaha Chapter NSDAR is committed to supporting active military and their families as well as local veterans. Contribute numerous volunteer hours to serving veterans at the Eastern Nebraska Veterans Home in Bellevue and the Veterans Administration Hospital in Omaha. Award an ROTC Medal and scholarship to a deserving student. Collect layettes for local military moms to help them welcome their new babies. Send holiday greetings and notes of appreciation to military serving overseas. Collect and categorize coupons to support military families. 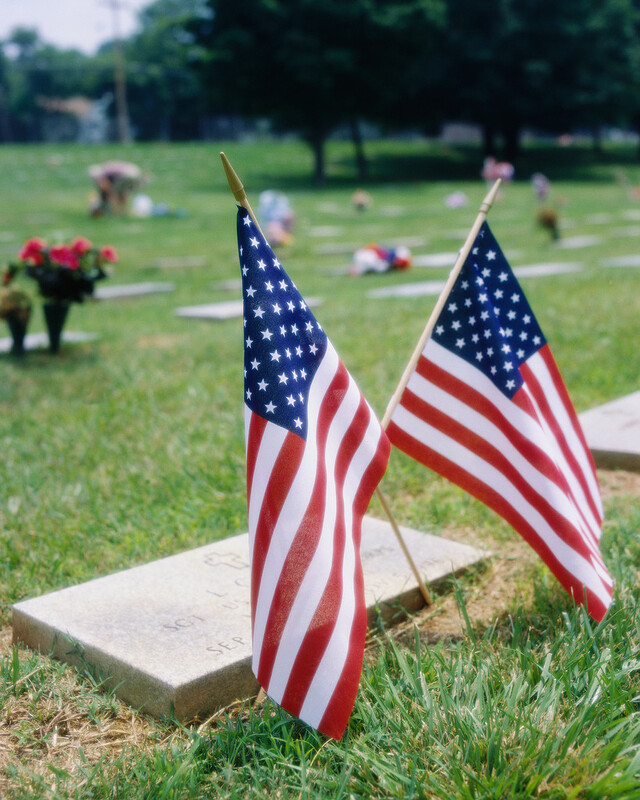 Attend commemorative events and decorate the graves of fallen warriors. In addition to chapter activities, Omaha Daughters serve in countless ways individually to demonstrate their gratitude for the sacrifice of our troops in the name of freedom. The preservation of our national heritage is central to the mission of DAR. Omaha Daughters, in conjunction with other Nebraska chapters, have been the impetus for several preservation and commemorative projects locally and regionally. In 1904, the Nebraska State Historical Society (NSHS) and the Nebraska Daughters of the American Revolution (DAR) helped dedicate the Fort Calhoun Lewis and Clark monument that commemorated the centennial of the historic 1804 council with the Otoe-Missouria. One hundred years later, the Nebraska State Historical Society partnered with Nebraska Daughters to celebrate the rededication of the monument. 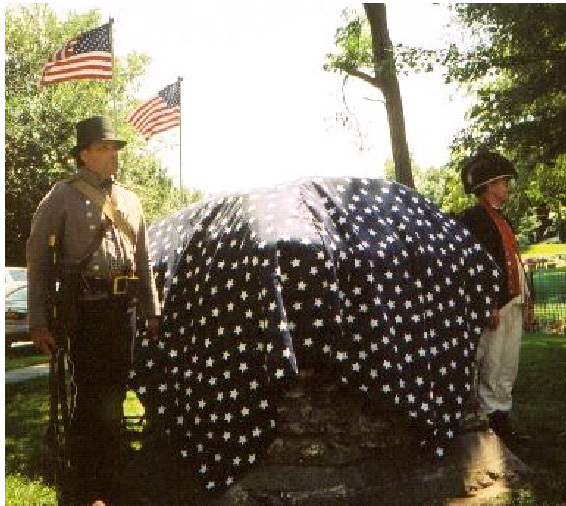 The monument was rededicated as part of the Lewis and Clark Bicentennial events held during the summer of 2004. 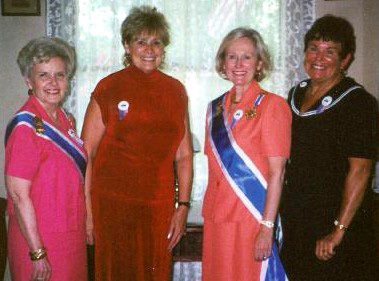 NSDAR Past First Vice General Fixmer, NE Organizing Secretary Sandra Spicer, NSDAR Honorary President General Wagoner, and Past Omaha Chapter Regent Harriet Knowles. As part of the ceremony, NSHS Director Lawrence Sommers recapped a speech given by predecessor Jay Barrett one hundred years ago. “This first council with the Indians was full of meaning. In the course of international diplomacy this republic inherited the fruits of two and a half centuries of discovery and exploration and established relations with the western Indian tribes.” More information on the monument and this important council with the Otoe-Missouria is available here. Omaha Daughters decorate graves of Nebraska’s Forgotten Patriots and one of Nebraska’s Real Daughters, Elvira Tewksbury. 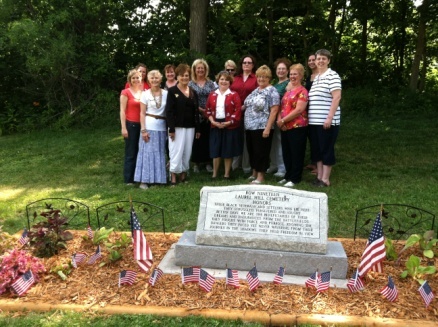 On June 14, 2012, our chapter celebrated Flag Day at Laurel Hill cemetery in south Omaha. We placed a wreath and a flag at the grave of Real Daughter Elvira Tewksbury. Mrs. Tewksbury was born in 1820 and was the daughter of Revolutionary War patriot, James Walker. An article from the Plattsmouth Journal, dated May 26, 1916, offers interesting insight into the service of Private Walker and the life of Mrs. Tewksbury. 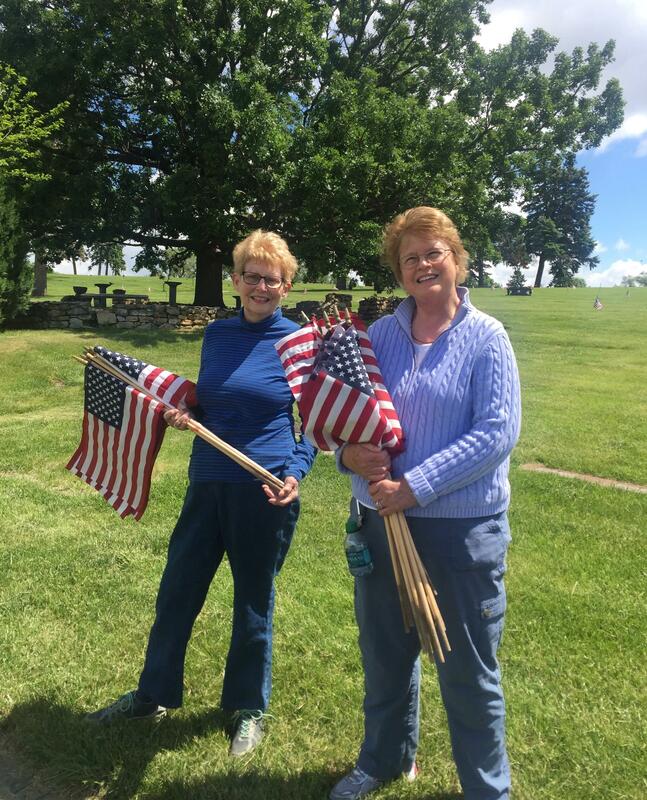 Omaha Daughters also placed 26 flags on the graves of “Forgotten Patriots” in Nebraska. These African-American and American Indian patriots were buried in unmarked graves until a combined headstone was erected to honor their service. Nebraska pioneers relied upon some of the Native Americans already residing in the area to be scouts for the United States Cavalry. These scouts are regarded as the state’s first military veterans. The Buffalo Soldiers, originally African-American soldiers of the 10th U.S. Cavalry who fought the Indian tribes, are also rarely recognized veterans. More information on Forgotten Patriots may be found here.